When I was first contacted about having my tank selected as Tank of the Month, I was truly surprised. Having seen so many spectacular systems showcased, I felt that mine could not compare. Of course I accepted, and now I would like to thank Reef Central and Reefkeeping Magazine for the honor they have presented to me. 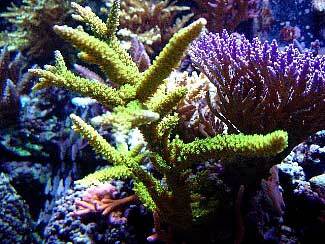 I have been involved with aquariums since I was 12 years old. 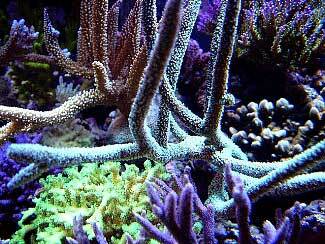 It was not until 1985, however, that I decided to try my hand at a beautiful saltwater aquarium. 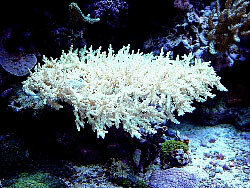 Here in Michigan, not many stores were willing to handle corals. 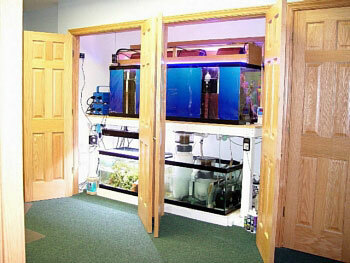 Most local fish stores had very little knowledge about reefkeeping. 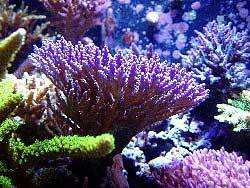 In 1995, I set up a 180-gallon aquarium, and I am fortunate enough to have Tropicorium located within 20 minutes of my home. 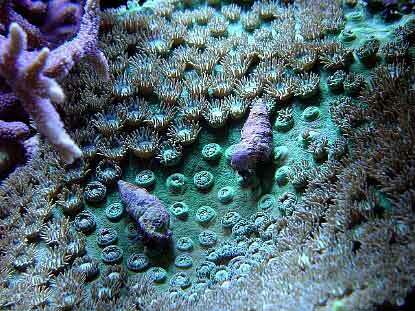 With such an incredible resource nearby, I was able begin keeping corals successfully. It has been many years of trial and error in the making, but with the help of all involved with Reef Central, I am able to present to you my current 180-gallon SPS dominated reef. 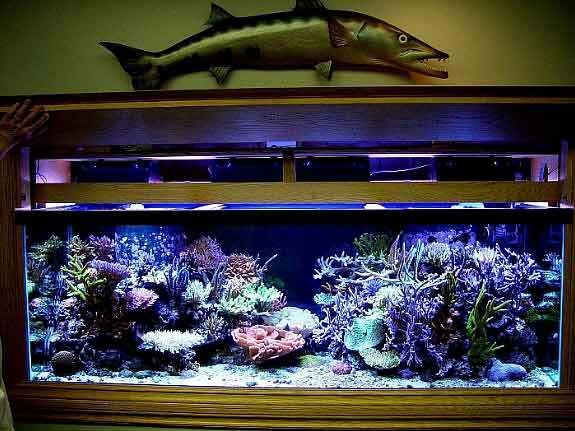 The tank is a standard 72" x 24" x 24" made by All Glass Aquarium. 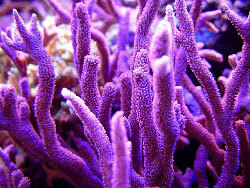 I set it up in January 2004, after my 90-gallon tank had become too full to continue my new found addiction: SPS corals. 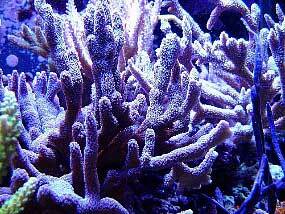 In fact, the Montipora capricornis is what really piqued my interest and tempted me to set up an SPS-dominant theme. I have modified a standard 100-gallon aquarium to create a sump, using 40" of it for the refugium, and the remaining 32" to house the skimmer, carbon and return pump. By my calculations the system contains a total of about 250 gallons of water. 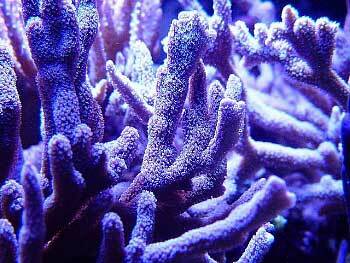 There are approximately 200 pounds of Fiji live rock, and almost 50 pounds of CaribSea reef grade aragonite which makes up the sand bed; to this I also added 20 pounds of GARF grunge to stimulate an initial boost in coralline algae growth. 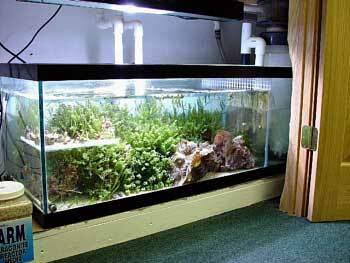 I use a method that has been fairly successful for me when it comes to substrate and aquascaping. I place eggcrate on the bottom of the tank and cut it to within two inches of the front glass. I then add a bottom layer of Fiji live rock, begin adding water, and then finish up the aquascaping. I place a substrate about ¾ -1" deep around all the rocks to cover the eggcrate, but never under the rock or in the caves. The eggcrate is used as a safety net in case of falling rocks, but it does add to my maintenance routine; to prevent the sediment from becoming solidified within the eggcrate's squares, I use a turkey baster to stir up the sand. 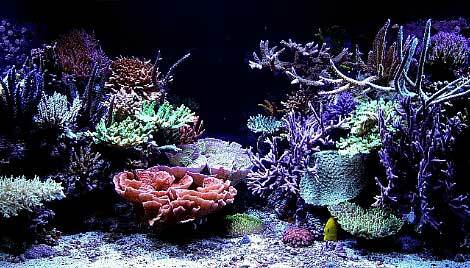 Aquascaping, in my opinion, is a very important part of reefkeeping. After the decision was made to install this aquarium in the wall, I decided that it must have the visual appeal that I had seen on some of the systems here on Reef Central. I was truly impressed with the designs from JB_NY, Steve Weast, Algaeman and others, so my main concern was to make sure I had it right the first time. After drawing out a plan and actually having all of my corals marked on the paper diagram, I proceeded to build my rockwork. About 16 hours and roughly 30 tubes of superglue later, I was finished. I must say that I am pleased with the results, and now that the corals are growing in, my original vision for the tank is starting to take shape. A Dolphin 2000 pump split two ways, and a Tunze 6100 on a pulse setting of 50-100% every five seconds, provide the system's circulation. 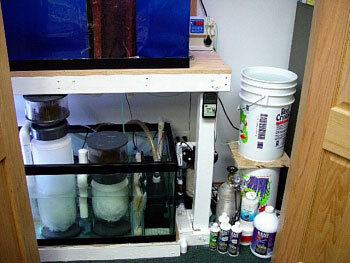 Both overflows drain into the 100-gallon sump's refugium area. This proved to be a bit of a problem when I first established the tank. Microbubbles were everywhere! 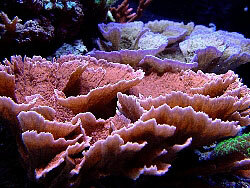 After adding the live rock and the macroalgae, though, the bubbles seemed to break down before entering the skimmer area. After the water flows through the skimmer area, it enters a small section housing the carbon pads and Polyfilters, and then flows into a small area dedicated for the return pump. My thoughts about filtration have changed many times over the years, from undergravel filters to sand beds. While I currently utilize a portion of each method, I have become content with my system as it is now. I believe the main form of filtration is the live rock, but I do not think the rock alone can handle all of the things we add to our tanks daily. That said, I have also made sure that I have good protein skimming. I am running two Euro-reefs: a CS8-1 and a CS8-3. My reason for using two is simply to have a back-up in case one was to stop for any reason. I use carbon and PolyFilters continuously, and I also have been thinking of implementing a few new ideas in my sump. My sump contains about three different species of macroalgae, but also houses a 12-inch Tridacna squamosa, a couple of scallops, and also an oyster. I am very curious to see if we could use these mollusks to our benefit in performing some type of rudimentary water filtration, similar to the zebra mussels we have here in the Great Lakes. I originally set up this system with four 175-watt Hamilton single-ended bulbs with parabolic reflectors, with additional supplementation provided by two 72" VHO bulbs. 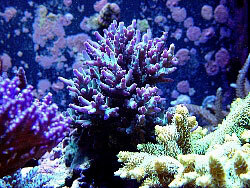 The colors and growth rates of the corals appeared to be the same as in my 90-gallon tank which, in my opinion, was excellent. But after countless conversations with much more experienced reefkeepers, I decided to upgrade the lighting. 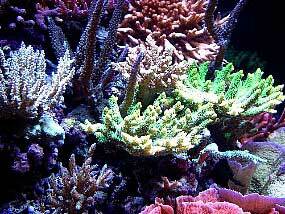 I am currently running four 250-watt HQI bulbs mounted in Sunlight Supply Reef Optic III reflectors. They are powered by two dual Bluewave HQI ballasts, which also run Hamilton's 14K bulbs. Two 72" VHO bulbs provide fluorescent supplementation: one actinic 03 and one daylight spectrum. 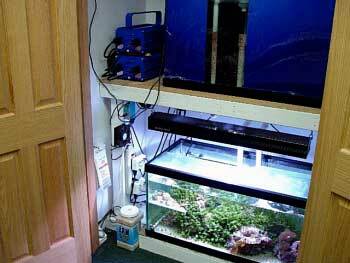 An Aqua Medic 250 watt double-ended metal halide running on a reverse photoperiod lights the refugium. All top-off water is provided by a six-stage, 100 gpd RO/DI unit. I then mix it manually with kalkwasser at the rate of six tablespoons per five gallons. The system typically evaporates three to five gallons each day. The continuous addition of kalkwasser has helped eliminate the pH fluctuations the calcium reactor was causing. With the addition of the four 250-watt DE bulbs, heat was an early concern, but I have been able to keep it under control with a 19" standard box fan and a 5" computer fan. They are on timers designed to start before, and stop after, the metal halides. The heater's controller is set at 77 degrees, and to be honest, between the fans and the heater, the water usually stays between 78 and 79 degrees. 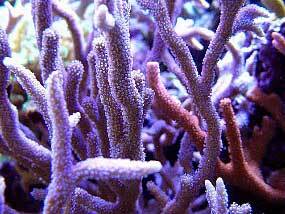 One factor in SPS reefkeeping that has been a problem for me is water flow. As well as I thought I had this system planned out in the beginning, I had overlooked the importance of providing good, strong current. 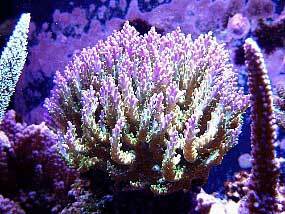 I knew how good the Tunze streams were and figured I would just use those and be all set, but as this tank matures I am finding that corals grow where they want, regardless of the consequences. My favorite staghorn coral has grown into the flow of the 6100 and had its tissue blown right off. While I am currently rethinking my flow options, I still believe that if they are properly placed, the Tunzes are still by far the best bang for the buck. 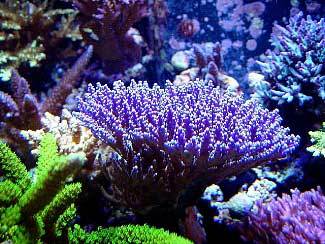 But I am trying to figure out how to increase flow now that the corals have grown in, possibly with a modified closed-loop system. 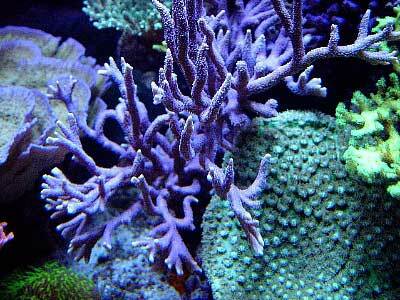 One of the best additions to this tank has been my reef-dosing pump, along with its built-in float switch. It has enabled me to add kalkwasser on a worry-free basis. All I have to do is set the drip rate and keep the six-gallon reservoir full of fresh kalk mix. To try to keep the system free of any extra nitrate beds, I am in the process of removing all sponge filters in the system. I have recently added a very simple modification to the skimmers, which of course I found here at Reef Central. 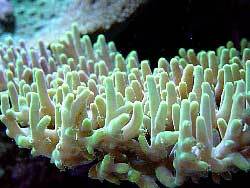 It consists of a PVC Durso pipe that eliminates the need for the sponge filters on the skimmers' outflows. 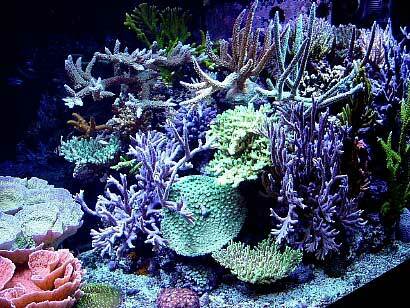 As inexpensive and easy as this was to do, I cannot believe that everyone who owns a Euro-reef hasn't already done it. 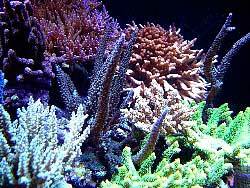 I change thirty gallons of water weekly, using Reef Crystals salt, and I replace the carbon pads and PolyFilters at the same time. 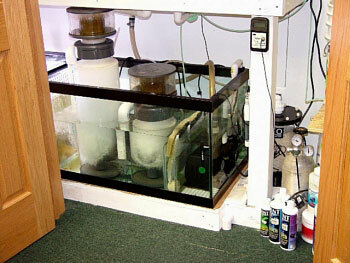 Additionally, I also clean the skimmers as part of the water change routine. One other thing I do weekly is to blow off all the rocks using a turkey baster and then stir up the substrate to help keep the detritus suspended. The two yellow tangs came from my 90-gallon tank, mostly for algae control. My thought was if I added these simultaneously at the initial time of set-up, they should keep algae problems to a minimum, but as everyone settled in, the inevitable happened: the two fought for over a solid month. 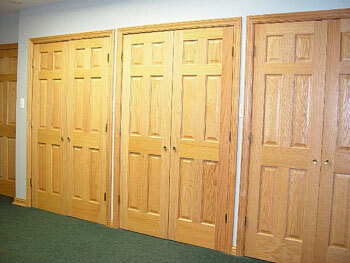 They have since calmed down, which is good because their removal would be quite an ordeal. My purple tang has been with me for about 18 months. 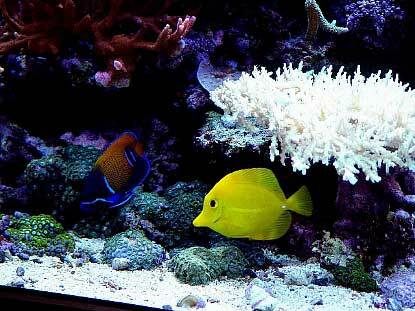 I think these fish are spectacular; while the other two tangs are useful for algae control, the purple tang seems to take care of quite a bit on its own. The six-line wrasse is one of my most comical critters. This fish is forever cruising the reef looking for food, and since he is also very useful in controlling parasites, I believe he is beneficial to the system. The bicolor Pseudochromis is a very aggressive fish, and seems to pick on/attack almost every other fish in the tank. Now that the pecking order has been established, all seems to be fine. My mandarin was a save from the local fish store. When I first saw it, I thought for sure it would not make it, but I had to give it a try. Now it regularly eats frozen Mysis and brine. I originally purchased the Banggai cardinals as a pair, but not long after their introduction, one of them was missing, and I have been afraid to add another. I am still considering another, though, in the near future. My two percula clowns have been hosted by my M. capricornis, and have been laying eggs continuously for about two months, which has proved to be a benefit in itself. The six-line wrasse has been very fat lately, and I assume it has been making dinner of most of the fry. My most prized fish is my majestic angel. It has been in the tank for only about three or four months. Early on, it grazed on every one of my SPS's. 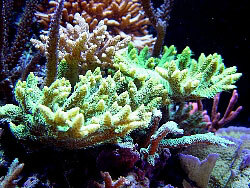 In fact, it had taken a real liking to my M. digitata, but now that it has become accustomed to eating nori from a food clip, and has begun to eat the frozen foods I use, the coral-picking has been minimal. I added the clown gobies after realizing that I had the dreaded "red bugs." While I am still afraid to use the Interceptor treatment for these pests, I believe these little gobies have helped to reduce or eliminate the "bugs" on the colonies they frequent, but they also pose another problem to those colonies; they eat the flesh from their preferred perches. 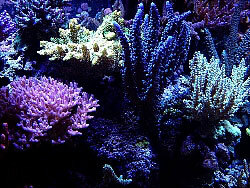 I have spent countless hours reading about reefkeeping and learning from most of what I have read. 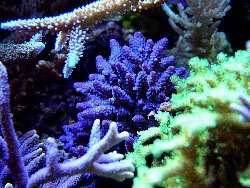 Early in my quest to keep SPS corals, I had many unanswered questions, as I am sure most of us still do, but one thing I have found to be true in almost every case is that it's not about only lighting, filtration, or even water quality. It is a combination of all three. 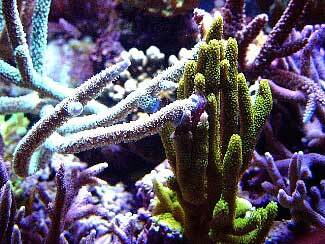 Reefkeepers must have patience; while this is a hard thing to teach, it is critical. No one can rush nature. I once read a discussion about tank maturity. I honestly believe this is real, but I also think it has to do with the hobbyist's ability to recognize his abilities. After getting "in tune" with the system, the hobbyist can tell at a glance what may not be right, and if he has the experience, he will know what to do to fix it. That comes only with time. I have to send out a special Thank You to all of my friends at Michigan Reefers, and a very special word of thanks to my good friend MUCHO REEF. 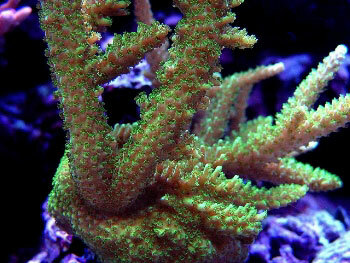 His ability to capture images of my tank has been a godsend. Without him I may never have been able to show off my creation. Please post any follow-up questions that come to mind, because I may not have covered everything, and I will be glad to reply to all. Again, I would like to thank everyone involved with Reef Central. Without them, my dream of re-creating the ocean may never have been achieved.